Germany's government has given final approval to a plan to extend the life of nuclear reactors, reversing a decision of the previous government. It hopes to pass the measures into law without putting them before the upper house of parliament, where the opposition has a majority. Opponents say this is unconstitutional and have vowed to mount a challenge in Germany's highest court. Ministers said nuclear was a "bridging technology" to a greener future. The government presented five cabinet ministers in Berlin to argue its case in a show of unity which suggested it was aware of the strength of anti-nuclear feeling among the public. 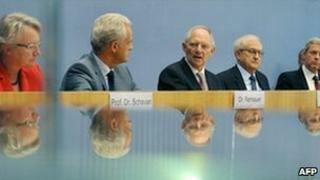 Opinion polls suggest that six in 10 Germans want nuclear reactors closed. The previous government - a coalition of the centre-left Social Democrats (SPD) and the Greens - had decided to shut down Germany's nuclear power stations by 2021. Under the new plan, reactors will continue to function for an average of 12 years. "For the first time in many years, a German government is setting out a energy plan for the long term," Economy Minister Rainer Bruederle told reporters. "It sets out a good and detailed roadmap with the era of renewable energy as the destination." The government wants to raise the share of renewable energy sources in power generation from the current 16% to 80% by 2050. A small crowd - between 100 and 300 people - protested outside the German chancellery on Tuesday, waving banners with slogans such as No Thanks To Atomic Power. Tens of thousands marched through Berlin earlier this month in protest at the plan.